Pioneers in the industry, we offer involute gear cutters from India. We are passionately engaged in providing an exclusive array of Involute Gear Cutters for our esteemed clients. 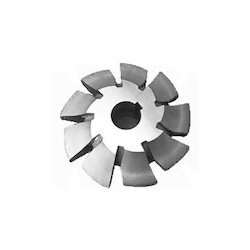 These cutters are used in generating the shapes required in different work pieces. These cutters are manufactured by our skilled professionals using quality approved material at par with the market prevalent norms. To avoid any kind of flaw, these cutters are thoroughly inspected by our quality experts. We are offering these cutters at most reasonable prices.